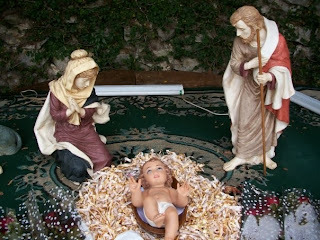 Just last Wednesday we celebrated the Solemnity of the Nativity of the Lord, more popularly known as Christmas. Today the Church pays homage to the Holy Family. The proximity of these two feasts is intended to remind us that Christmas and the family are intimately linked. It’s easy to think the Incarnation means God took on a human body; that he appeared in human flesh. But there is much more to it than that. In Jesus, God unites himself to an entire human nature. He fully enters into human experience, with all its peaks and valleys. And a part of that human experience, with more than its share of peaks and valleys, is family. Christ came as a member of a human family to enable us to be part of God’s family. But there is something more which the liturgy wishes to convey to us by this connection: the Christmas season is one of light but also of shadow. The day after Christmas, we celebrate the feast of the proto martyr, St. Stephen. Two days later, we mark the feast of the Holy Innocents, the children slaughtered by Herod. The joy of Christ’s birth is suddenly tempered by tragic reminders of what the Incarnation cost. The white permanently stained by the red. And the Holy Family shared in that. One can see a trajectory being drawn from the wood of the manger to the wood the cross. In so many ways, these two singular events are inseparable. One led to the other. Joy and sorrow are side by side, linked by sacrifice, by faith, and by love. It is the story of salvation. And it is the story of the Holy Family. Now when we hear the title of this celebration, the Solemnity of the Holy Family, we are inclined to just dismiss the possibility that our families can be like the Holy Family. The personages of Jesus, Mary and Joseph can at first seem to be too unreachable an ideal for our own family. Every family is far from the ideal because every family is made of unique individuals with their positive qualities and their negative quirks. Perhaps, especially at this time of the year, we are most intensely aware of the limitations of our family - of the various families we are a part of. Family reunions can often be marred by quarrels and misunderstanding. Selfishness, stubbornness, independence can appear to be so great that we can question the integrity of our family as a family, let alone see any real holiness there. In all families, we will witness the same interplay of light and shadow. In our painful introspection, we forget that the name of our feast is not the Feast of the ‘Ideal Family’ or the ‘Perfect Family’ but of the ‘Holy Family’. The Holy Family was not spared the intermingling of light and shadow. The Holy Family was holy because their lives were centred on God, and not because they were preserve from misfortune and trouble. By today standards, the Holy Family would have been categorised as dysfunctional, far from the ideal. Joseph was married to Mary but is not the biological father of her son. In fact, Mary and Joseph, though publicly married, were actually living sexually continent lives. Right from the beginning, the family was condemned to wander as homeless refugees, fleeing the clutches of a power mad and blood thirsty despot. Poverty would trail them throughout their lives. According to Tradition, which is implied in Sacred Scriptures, Mary seemed to have been widowed at a young age, thus leaving her in the role of a single parent with Jesus orphaned. There is enough juicy stuff here to produce a dark satire of a movie on the Perfect Family! The Holy Family is proof that God's greatest work on our behalf and for our salvation begins in tragedy, in misfortune, in hardship, in poverty, in silence, and always invisibly. The work of God is never done in a vacuum of imperfection. God is indeed subversive – He uses our darkest experiences and imperfections as the raw material for perfection. Within the Holy Family, we see the ‘perfect’ model for families struggling with their imperfections – the broken families, the single-parent families, the families that are struggling to keep their relationship together. Jesus truly understands what you are all going through and the struggles that you are experiencing - broken relationships, betrayals, and hurts are inevitable. But the Holy Family also gives us a picture of hope. If God is at the center of family life then no matter how big the problem may be, no matter how serious the hurts may have become, no matter how wide the chasm that has grown between individuals, the presence of God assures us that our lives are not ultimately defined by sin but by the love which God has poured and continues to pour as a balm into our lives. Holiness, therefore, is the remedy which heals, strengthens, bonds, and brings about a great measure of the peace for which our hearts so ardently long; for in holiness we embrace Christ, the new beginning of the new creation. In Christ, we get to start all over again. Today, family life is under siege. Society provides an entire range of products from family therapy to self-help books to assist couples and families to weather the trials and difficulties encountered. What does the Church offer? What can the Church offer? The Church offers us holiness. The only adequate response to the terrible scandal of broken marriages and dysfunctional families, the only fully Catholic response to this scandal — as countless other saints have recognised in every century is holiness! The answer does not lie in family counselling, communication skills, therapy or separation or divorce. The problem with family life today is not just about dysfunctional behaviour, emotional baggage, or cultural influence. It is and always has been a problem of sin, the sin of individualism, the sin of selfishness, the sin of unforgiveness, the sin of infidelity, the sin of pride, the sin of lust. When sin latches onto to our family life, the members slowly forget their most fundamental vocation, that is to be holy. A true return to authentic holiness is the answer to the many ailments which plague us. Every crisis that the family faces, every crisis that the Christian faces, every crisis that the world faces, is a crisis of saints; it is a crisis of holiness. It's a tough time to be a married person today. It's a tough time to be in a family today, what more a holy family. The world ridicules holiness. And yet, holiness is the only solution which can save the world. How do families grow in holiness? Sacrifice, prayer and faith are the basic ingredients of holiness. Every family needs to begin by cultivating and promoting a life based on these three – sacrifice, prayer and faith. This may sound naively simple and even simplistic; but quite often the most profound answers to our most pressing problems are fundamentally simple. It is man’s pride and ego which seeks to convolute and complicate. So, the Holy Family reminds us that family life is not some Utopian ideal where everything is perfect and that there are no struggles. To be ‘Holy’ does not mean you need to be unreal, over-idealistic, Pharisaic or a party-pooper. It does not mean running away from the world or opting out of marriage and family to enter a convent, monastery or seminary. The feast of the Holy Family shows how far off-base these stereotypes of holiness are. It reminds us, as Vatican II teaches, that all human beings are called to the heights of holiness. That all states in life offer abundant opportunities to grow in faith, hope, and love. That the nitty gritty of family life, if approached with sacrifice, prayer and faith as its foundation, can be a road to profound personal transformation and communion with God. The bottom line is this – we don’t become holy despite the busyness, the troubles, the hard-knocks of family life, but in and through them. Holiness is allowing God to fill up the holes, tie up the loose ends, and smooth over the rough edges that comes with living in a family. In this environment of openness to God's grace, God can do more than we can ask or imagine. And, like the Holy Family, we can be living witnesses, that "nothing is impossible with God."